… Even though many of them have never seen it, and may not even realize it exists. A DMU is the technical name for an onsite USPS office, and having one right in the middle of our mail processing operation is an absolute win-win for all parties involved: Midwest, our customers, and the USPS and its employees. It’s a privilege to gain USPS plant-load status, allowing Midwest to host a US Postal Service office on-site and at-the-ready to help further our customers’ needs. Hosting a DMU means your mailings undergo inspection and approval right here, at Midwest! What’s the big deal? Most mailers load up their trucks and drive to a USPS facility for inspection. Drivers navigate traffic, and then a crowded loading dock, as they jockey for a spot in line. If something is wrong with the mailing, the truck is loaded back up, and back to the processing plant goes the driver – carrying your mailing along for the entire ride. It’s a potential logistics nightmare. But with an on-premise BMU, a strong relationship develops between the postal experts and the mailing service operations team. We’re working together with our dedicated postal pros to fix and prevent problems, through wide open lines of communication. The bottom line for customers: Expert oversight of your mail preparation, and faster turnaround times for your presorted and commingled mailings. Who gets a BMU? High-volume mailers “are authorized if they benefit the USPS.” Mailers doing several hundred thousand pieces a day, minimum, can apply. 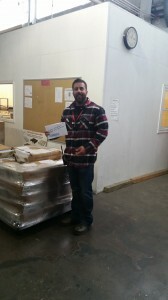 Here we see one of our operations supervisors Dave Manista outside of Midwest’s DMU, inspecting a mailing before it’s shipped out.